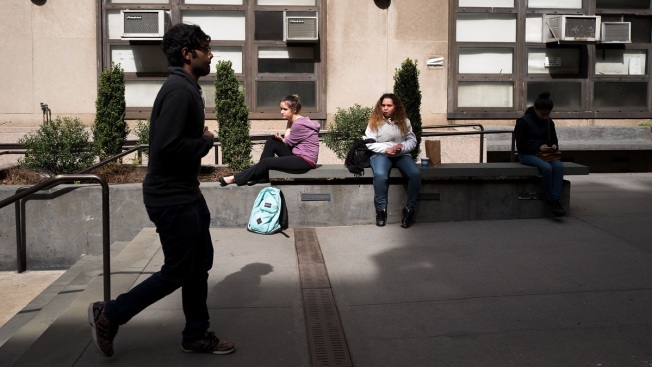 In this April 10, 2017 file photo, people and students on campus of Hunter College of The City University of New York, April 10, 2017 in New York City. It sounded like a scam. Three weeks after Hurricane Maria struck Puerto Rico, Brown University was offering to pick up 40 of the island's top students in a private jet and shuttle them to the Ivy League school to study for a year. And it would all be free. Coral Murphy was suspicious, but she applied anyway. Even after the acceptance email arrived, she still had doubts. Reality set in only after she got to the airport and boarded the jet, where students were served sparkling water and sandwiches garnished with edible flowers. "I'm still kind of in shock," said Murphy, 20, a junior in journalism who is now in her second term at Brown. "I'm like, 'Where am I?'" Murphy is among hundreds of Puerto Ricans who have come to colleges on the U.S. mainland following the devastation wrought by Maria, often drawn by offers of free or discounted tuition from schools hoping to help students continue their education while the island recovers. Most of the offers are for one or two semesters, with the expectation that students will return to their home universities in Puerto Rico. But some educators in the U.S. territory worry that some of the Caribbean island's brightest students won't come back to an already beleaguered public university system. "Some of these programs have targeted the cream of our crop, the best we have," said Don Walicek, who teaches English and linguistics at the University of Puerto Rico. "Will they ever come back to Puerto Rico?" Even before the hurricane, enrollment had been falling at the University of Puerto Rico, where students went on strike last year protesting deep budget cuts. When the system's main campus at Rio Piedras reopened after Maria, more than 900 students — roughly 6 percent of the student body — did not return. Those who relocated are among thousands of other Puerto Ricans leaving the island, where electricity is still in short supply amid a grueling recovery process. The tuition offers from mainland universities are modeled on programs created in 2005 to help U.S. students displaced by Hurricane Katrina. But Walicek and two other professors wrote an open letter in November noting that, unlike schools in New Orleans that closed for months, the University of Puerto Rico reopened just five weeks after Hurricane Maria. The exodus of students has reduced enrollment, forcing the cancellation of some courses. Officials behind the assistance programs say they're only trying to help, and they're encouraging students to return home after this school year. Administrators at Brown add that they partnered with the University of Puerto Rico and got approval for every student in the program. "We want and expect them to return to their home institutions to conclude their degrees," said Marisa Quinn, chief of staff to the provost at Brown. "We really don't want to do anything to undermine the university's capacity to reopen and recover with great strength." A total of 30 students accepted Brown's offer and arrived on campus in October. Other schools hosting students at no charge include Cornell University, which has 58 students from Puerto Rico this term. New York University is hosting about 50. Tulane University enrolled 16. Some are offering language support to students from the Spanish-speaking island, while others required applicants to be proficient in English. Dozens of other schools have offered reduced tuition rates typically reserved for state residents, a move adopted by all public universities in New York and Massachusetts. A smaller group of schools also has extended this discount to students from the U.S. Virgin Islands, which was battered by storms Irma and Maria. For universities, the act of charity can also bring a boost in publicity and a crop of talented students. While a year at Brown or NYU can top $70,000, many schools are adding students within their existing capacity, limiting the cost. In many cases, donors and foundations have chipped in. Many students who came to the mainland say they feel pulled between an allegiance to Puerto Rico and the bright opportunities they see here. Some vow to return home, but others say they'll apply to other mainland schools or return for graduate studies. The Massachusetts College of Art and Design in Boston brought 10 students from Puerto Rico last month, including some who see the program as a stepping stone. "If I see another option, I will take it," said Tanisha Pacheco Rodriguez, a senior painting major, adding that after the hurricane hit, morale plummeted at her school, the School of Visual Arts and Design of Puerto Rico. "I appreciate this moment because it's like being reborn." At Brown, sophomore biology student Andrea Rodriguez-Villafane said she wants to keep studying on the mainland, where she says internships are easier to find. "Here, they give you opportunities on a silver plate. At the University of Puerto Rico, you have to search for them and be extremely determined," she said. "They won't come to you." In Puerto Rico, she fears the threat of new budget cuts at school and the danger posed by future hurricanes. But she is conflicted, because it's also her home. "I'm pretty terrified, but at the same time I have family in Puerto Rico, and I also feel this sense of responsibility that I should come back," she said. "If everyone leaves, who will be there to help Puerto Rico?"